“When it rains it pours,” so goes the Twiddle standard, and so went the show when Seattleites packed Nectar Lounge on a remarkably dreary October school-night to see the just-shy-of-mainstream jammers deliver two fiery sets of crowd-pleasers. Local group Spyn Reset perfectly complemented the main act with their opening performance of electronic rock. The band sounds like a metal-tinged Juno What?! : traditional rock drums with heavy guitar, centered around synth keys and altered vocals of the lead, YASU. Late in the set, YASU stood alone on the stage for an outstanding solo of looping keys that, against all odds, momentarily caused the restless audience to forget how eagerly they were waiting for Twiddle. This was no small feat considering the absolute devotion the “Frends” have for Twiddle (there “ain’t no ‘i’ in ‘frends,’” so say those of the Twiddle universe). By the time the band took the stage, the rail-riders had formed a sort of hierarchy based on Twiddle loyalty. A mild-mannered gentleman with the words “JamFlowMan Don’t Give a Damn” emblazoned on the back of his shirt was allowed the front center position for the entire first set. The stage was littered with unexplained kitsch: a Yoda doll, a plush raccoon, a small statue of Buddha holding a crystal ball, and the like. No one questioned the collection, we just admired it. If you have heard anything about Twiddle, you know the band often draws comparisons to that other band* from Vermont: four dudes with a very decent light rig, heavy on guitar jams and thumping bass lines. 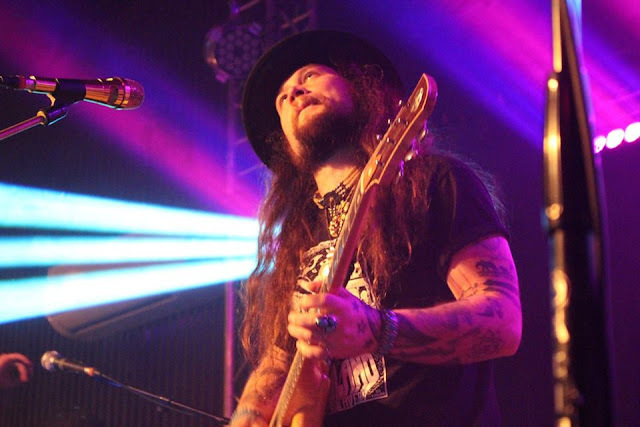 Mihali Savoulidis has an incredible command of the guitar, making his instruments’ melodies really sing, slightly overshadowing his actual unique and engaging singing voice. Ryan Dempsey (keys), Zdenek Gubb (bass), and Brook Jordan (drums) provide weighty backup and intermittent solos. This was only my second time seeing Twiddle live, and I felt like the three non-guitarists were shining just a little brighter this time. Though Savoulidis is entertaining on his own, I am sure many fans would be thrilled to hear the other members featured more prominently as the band continues evolving and producing new music. Over the course of the evening, I was constantly hearing influences from other bands and genres, sometimes only for a measure or two, though Twiddle never strayed from the core makeup of that particular song or from their overall sound. Aside from the typical jam band sounds, there were influences of reggae and metal, a few Dopapod-worthy sections, and bass lines that were in the range of Red Hot Chili Peppers all the way to Ott. Perhaps some credit is due to the sound engineers/instrument technicians that Twiddle brought on tour (definitely a plus), but the songs are crafted in a way that allows ample room for emulation of a wide range of musical styles while staying true to the Twiddle feel. The Frends are definitely onto something here. Twiddle’s sunshiny live show is a welcome cure for a dark rainy night, whether you are at Nectar’s in Burlington, Vermont, or that other Nectar in Seattle, Washington. *It’s Phish. You know this one!